The World’s most expensive pizza resides in the streets of New York City, starting cost per slice is $250, but that does include 24-karat gold. Still hungry after one slice? New York City’s Industry Kitchen offers whole pizza’s for only $2,000. 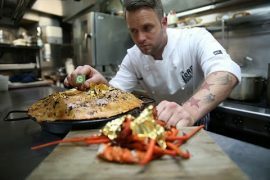 The expensive pizza recipe includes flakes of 24-karat gold from Ecuador, white Stilton cheese imported from England, French foie gras, truffles, and Ossetra, a caviar from the Caspian Sea that generally costs $12,000 per kilogram. If you really want to splurge on this decadent dinner, you have to order it 48 hours in advance. CLICK HERE for the World’s most expensive fast food restaurants!